Verizon does not control settings for 3rd party apps. From the Home screen on your device, open your Facebook app. 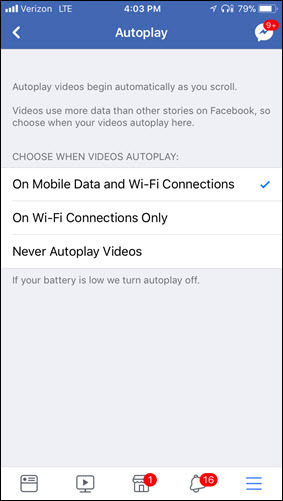 On iOS devices navigate: Menu icon (lower-right) > Settings > Media and Contacts > Video and Photos > Autoplay then select the preferred Autoplay option. 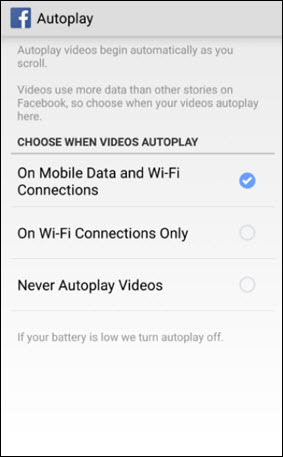 On Android® devices navigate: Menu icon (upper-right) > Settings & Privacy > Settings > Media and Contacts > Autoplay then select the preferred Autoplay option.